This live cone and spiral topiary offers verdant green leaves and beautiful foliage that are made to brighten up any area. 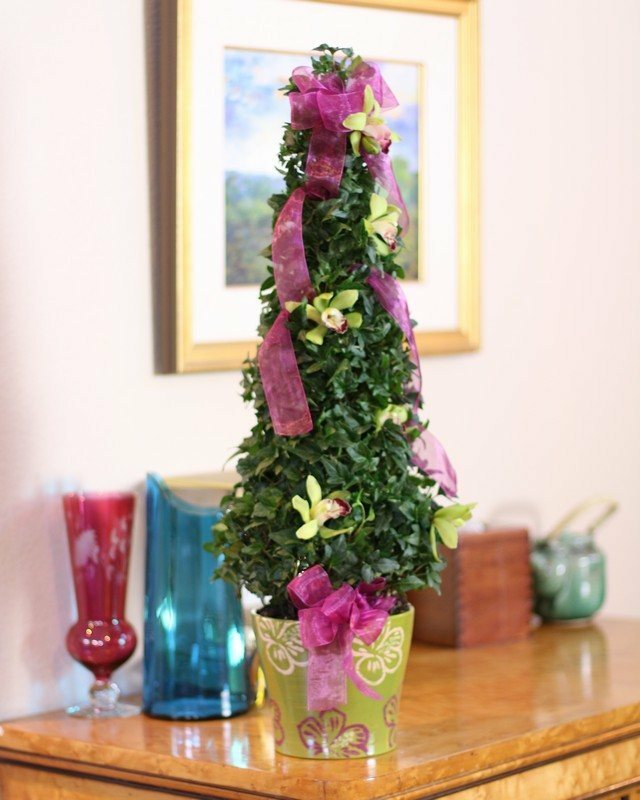 Designed to work well in bright, indirect light, live topiary trees work well with in indoor temperatures of 40° to 80° F. With a pot size of 6.5 inches, this fresh topiary is offered with options like a terracotta pot or Mylar spring wrap for an additional fee. For ideal growth, the soil should be allowed to be almost dry between each watering. Live topiary trees require certain types of conditions in order to thrive. They are fairly easy to take care of and will grow well if owners follow some basic steps. Indoor ivies are able to handle humid air and are intolerant of dry, hot air. It ends up drying out the plants, so ivy topiaries should be kept away from heating vents during the winter. They do the best in temperatures of 55° to 65° F, but can withstand a wider temperature range. During summer months, a fresh topiary requires additional shade to protect it from the harsh summer sun. A shady protected spot, a well-lit bathroom or next to a larger plant will help to keep it healthy. To prevent spider mites, individuals should dust the plant because spider mites love dusty surfaces. During milder weather, the plant can be placed outside for brief stays for an extra boost of vitality. To give the plant the humidity that it thrives on, owners can mist the air around the plant frequently. During hotter weather, sphagnum moss around the base will help to lock in some of the humidity. The plant should be allowed to drain freely so that water does not end up building up around the roots of the plant. If the topiary is water too frequently, it can end up causing root rot or other issues. As a rule, most topiaries will do well with a normal houseplant fertilizer. To maintain the topiaries beautiful shape, individuals can use pruning shears to remove the outer tips. In addition to shaping the exterior of the plant, this technique will help to ensure that it grows into a bushier cone. For alternative shapes, the live cone and spiral topiary can be shaped with wires from a greenhouse. This can be done to encourage it to grow in any shape or to ensure that it remains in its original cone shape. Beautiful and serene, a good topiary will grow for years if it is properly taken care of. It can decorate an interior room or a well-shaded porch. As long as it is protected from temperature extremes, it will keep thriving and brighten up any area.